Eighteen images have been selected as the focus of the exhibit. 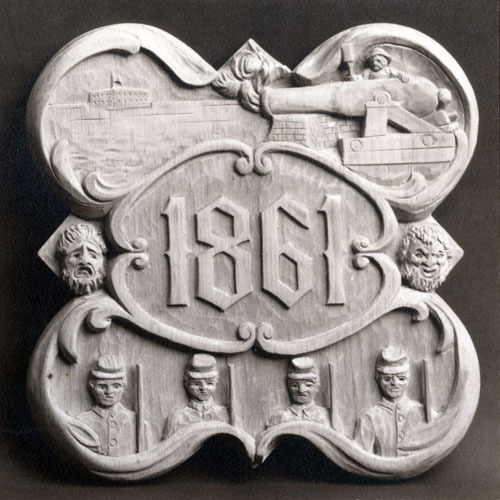 Each image includes a description of the symbols employed in the plaque design and is written by the carver of the plaques, John Gregory Wiggins. In addition to the individual entries in the exhibit you can take a quick overview of the plaques by viewing a slideshow of the images. The exhibit offers a great introduction to this School tradition, and helps to decipher some of the interesting imagery used to depict aspects of St. Paul’s School history. 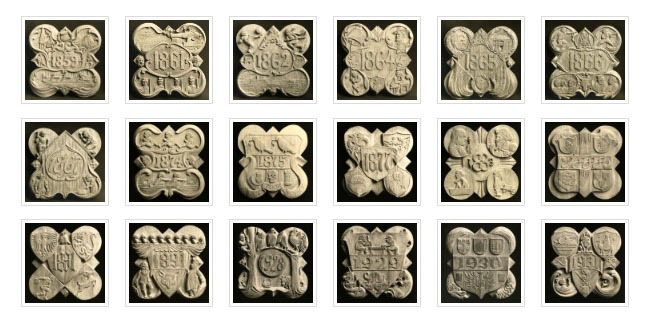 There are a total of forty-two Form plaque images now on OLDA which can all be seen by clicking HERE. A more detailed description of the history of the Form plaques and the work of John Gregory Wiggins can be found HERE. Both of these links provide a great introduction to the types of imagery used in the early Form plaque designs, and browsing through the exhibit as well as the individual entries will be a helpful reference source for students in developing themes and design concepts for future plaque designs. Researching the history of the Form plaques is a fascinating process, and the archives at SPS has yielded some interesting artifacts. 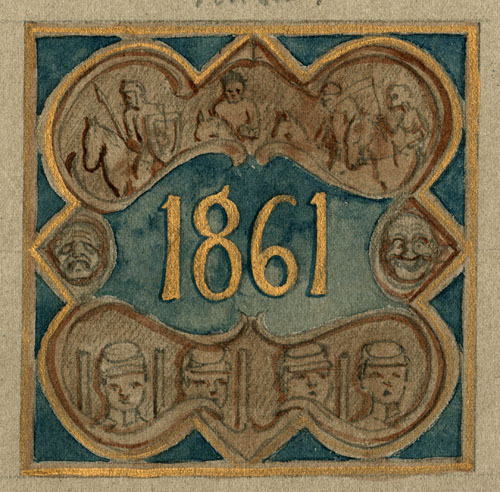 Among these materials are a few of the original concept sketches for the Form plaques, this one from the 1861 plaque described in this earlier post.
. . . that when the line of head panels have strung out to a sufficient extent the molding around them, and the panels themselves, are to be picked out in color. I feel sure that this will give a bully “band of color” eventually, though if it were done before a large portion of the room were paneled, it would look very queer and startling. That is the reason I am against putting in any color as yet. Personally, as you know, I like a bit of color or gilt in these decorations. I think that the effect of a long row of decorations, heavily carved, without some lighting up is apt to be like monastic choir stalls, rather dusty. The primary object of these panels is to designate the Forms whose names are carved in the panels below. The carving around the numerals is of distinctly minor importance and its purpose is to frame the Form numbers, and eventually to form a band of color and carving running around the entire length of the wainscoting. Anyone who has seen the original plaques that are in place in the Upper Dining Hall will find this a little surprising because there isn’t even a hint of color on any of the plaques displayed there. 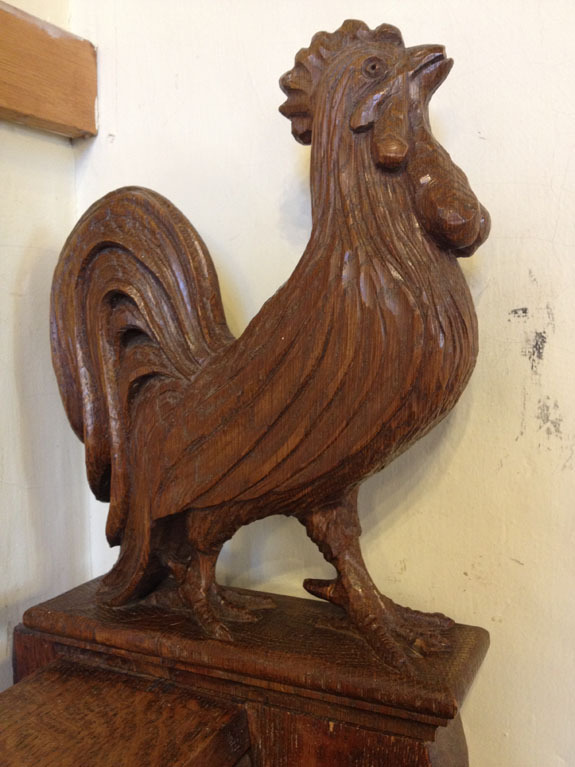 The entire group of plaques are stained with a dark oak wood stain matching the rest of the woodwork and paneling of the room, which would appear to be the opposite of Wiggins original intent. It will be interesting to see if the reason for this change of plan emerges with further research. John Gregory Wiggins was able to express his vision of color for the plaques eventually. The hallway leading to the Upper Dining Hall displays the last series of plaques he carved, ending in 1953. The next time you are heading to the dining hall for a meal, take a moment to look at these painted plaques and then imagine what that “bully band of color” would have looked like if Wiggins had been able to paint those plaques as he had originally planned. These Medallions are distinguished for their charm of execution and their sympathetic treatment, each one of them being connected with some episode in the history of the school, or of the Country. 1861—-The outbreak of the Civil War is suggested by Fort Sumter and an old-time cannon, the sort which was raised and lowered by using wooden wedges under the breech. The lower half of the panel shows the schoolboys drilling, and in the corners are a tragic and a comic mask to indicate the charades which were very popular as school entertainments at the time. All of the plaques from 1859 through 1990 (the last Form a plaque was completed for) have followed this same basic theme – incorporating symbols from the SPS microcosm with major events from U.S. and world history. Collectively they form a visual history of the School, and the experiences of its students in the wider world. It will be interesting to see what transpires during this school year that will add another page to this unique history.